One morning, a young geneticist awakes with a box on his head. The box is simple, unadorned cube and a familar, comfortable shade of brown. At first he thinks it's a dream, or a morning like when you're a sick child and your eyelids stick together, but he soon learns that the box is permanent. His questions begin to loop: am I alone, or is there someone else out there? 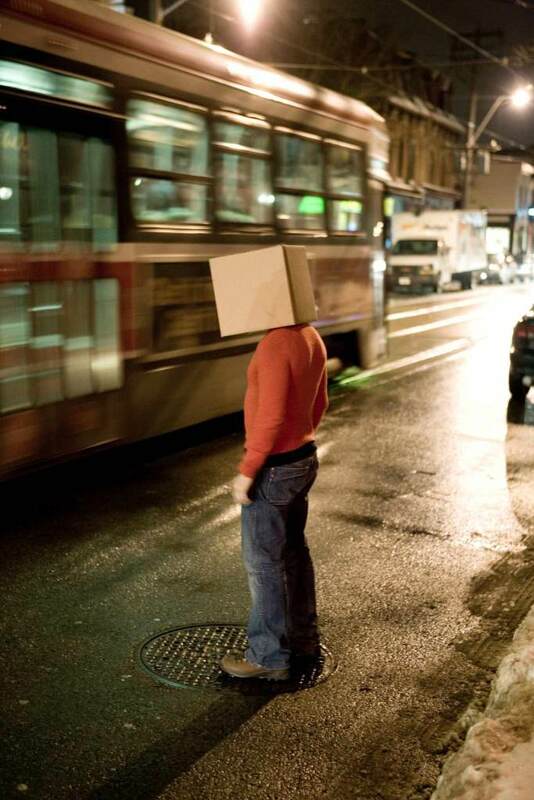 Unable to find out, and unwilling to kill himself, [boxhead], the star of the show by the same name, decides: "If I can't change the quality of my life, at least I will change the quantity!" And then he doubles himself through a miraculous DNA transfer. Playing with obvious and familiar questions is a constant, and successful, strategy in [boxhead], brought to Mag North by Toronto's Crow Theatre and playwright Darren O'Donnell's Mammalian Diving Reflex. Is the audience the actor's dream? Is there a god or gods? Can humans ever connect? Actions and witty dialogue swirl around the question of whether the cloned-boxhead is himself plus another, or just himself. Two gods,present as disembodied voices, want the humans to remain dependent. The two human and two divine voices are mic'd and electronically processed and can only be differentiated by syntax, or can't be differentiated at all. And once the boxheads are named – as Drs.Thoughtless Actions and Wishful Thinking, played by Adam Lazarus and Andrew Shaver respectively – their drive to discover an echoless echo gives them increasing confidence. The gods are, as in most human cultures, beautiful in their own way. From the start, two blue-lit hands hover above the playing space. It doesn't take long to figure out that someone is sitting there playing drums and other, more melodic percussive instruments to move the dialogue around emotionally. The magic remains, though, because the musician (Ed Reifel) times his hands perfectly with the bodiless voices of two gods who long for the days of monotheism. “They won't need us anymore!” one god laments repeatedly. At another point, one pleads: “hold me!” “I can't hold you ... we don't have arms.” Beat. “Well – well – then hold me in your thoughts!” the first replies. As the boxheads address meaning and failure “so useless it can't even be used as toilet paper” they're not so different from most other North Americans psychologically, but their cubed heads add a poignancy to the scenes. The contrast between “normal” conversations and impossible physical presence makes existential questions fresh and re-engaging, instead of predictable. The Doctors become lovers; they do a few dance numbers (to disco, to Abba, to some heavy metal); they worry about whether to procreate. Ultimately, they create a doorway out of their blind belief. Clearly, we humans are earnest in our desire for meaning, but also a bit silly in how far we'll take our explorations. Originally produced in 2000, [boxhead], lays out what's become a throughline to much of O'Donnell's work: if different divisions of “we” just talk to each other, we might actually like each other. It takes an impressive amount of talent, clearly demonstrated by all the actors, stage designers, and O'Donnell's script itself, to make that simple, almost bland statement into the funny-as-hell play that [boxhead] is.